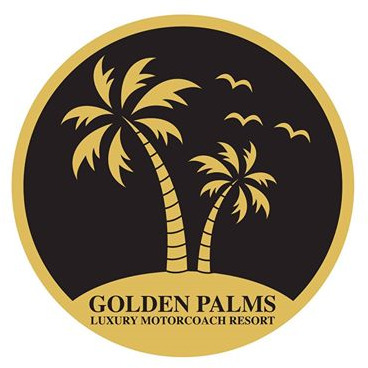 Golden Palms Luxury Motorcoach Resort is a small intimate gated community for Motorcoaches. The concept and spacious lots cater to the owner rather than the renter. The majority of lots are on a crystal clear 22 acre lake in a relaxed natural setting. There is plenty of room on each lot to give individual owners space to build 500 sq. ft casitas and to accessorize them with options like summer kitchens, fire pits, lush landscaping and even a pool or spa. This is sure to be the perfect setting to spend your winters in sun washed Southwest Florida. Spacious 35'x90' lots in a gated community. Lakefront pull-in sites for motorized RVs or back-in lots for towable RVs. We offer enhanced hookups with 50/30/20 amp service, hard-wired internet, resort-wide Wi-Fi, clubhouse with kitchen, ballroom, activities, billiards, cards, fitness room, heated pools, hot tub, 2 lakes and a nature trail. A very active 55+ park with 39 sites. Located on the Intercostal Waterway with direct access to the Orange River, Caloosahatchee River and the Gulf of Mexico. Rec hall, daily activities, full hookups, boat ramp, heated pool, bocce ball, shuffleboard, horseshoes, 9-hole non-regulated golf course and laundry for you to enjoy. No pets. Closest full-service RV resort to I-75. Offering 75' concrete pull-thrus and only 11 miles to Barefoot Beach with 2 miles of unspoiled white-sand beaches and no high rise condos here. Easy in and out. Many wooded sites, 30/50 amp service, heated pool, jacuzzi and boardwalk nature trail. In the center of area attractions. Big Rigs welcome. Nestled between historic Tamiami Trail and Ten Mile Canal, Fort Myers RV Resort offers the quiet peace of the country, yet it is just a short drive to a variety of local attractions. Nature presents a year-round treasure of warm, clear sunny skies, rich tropical foliage and a fascinating array of gentle wildlife. Clean and Quiet. All sites have 10x20 concrete patio. Full Hookups. Community Center has Wi-Fi and Cable. Easy to find. A lot of restaurants and shopping in area. 2.5 mile downtown Ft. Myers. Located on the Intracoastal Waterway of the Caloosahatchee River. We offer 48 concrete 100' long pull-thru sites and 296 regular sites, some with docks. Enjoy our new rec hall, planned activities during season, full hookups, tennis, boat ramp, kayaking, boat rental, heated pool, spa, shuffleboard, horseshoes, Wi-Fi and a 9-hole non-regulated golf course. A unique gated community nestled among the trees of a former orange grove. Located between Ft. Myers and Naples, near some of the most beautiful beaches. Our sites are very spacious and offer you the privacy to enjoy the nature and beauty that surrounds you. Enjoy beautiful sunsets and visit one of 3 pools. There is so much to do at any age. Family-operated park, just off I-75. Get back to nature with our native trees and plant life. Enjoy the adult section or bring the entire family. Bathhouse, laundry, and swimming pool add to the relaxed feel of the park. We also have a convenience store that sells soda, propane, ice cream, chips, beer and cigarettes. We have free Wi-Fi. With a seemingly endless array of amenities, plus a myriad of local attractions, you'll stay busy all day! This resort offers a spectacular clubhouse, heated swimming pool, whirlpool/spa, rec center, on-site activities and events, tennis, basketball, billiards, volleyball and so much more! Resort cottage rentals are also available. On the Imperial River. Full hookups, 20/30/50 amp service, pull-thrus, shuffleboard, bocce ball, horseshoes, tennis, pickleball, weekly dances with live bands, tap and line dancing, exercise classes, arts and crafts and bike club during season. Two laundries, restrooms and showers. Big Rigs and pets welcome. WiFi available. 55+. Amenities at Swan Lake include a heated pool, billiards, 8 shuffleboard courts, shaded sites, private showers, clubhouse, friendly senior adults, in season activities and leashed pets (20 lb. max.) are welcome. Close to the Caloosahatchee River, shopping, fishing and the beaches of Ft. Myers, Sanibel and Captiva Island. Family-owned and operated.